Ether Books, the crazy 2010 start-up that became the first publisher to release stories by me, are today celebrating the launch of version 1.4 of their fantastic iPhone App. For those who don’t know the Ether Books App, quite surprisingly, offers its users the opportunity to download short reads on the move. So if you have a tedious commute every day, which doesn’t involve you having to keep your hands on the steering wheel (! ), you can load up on loads of stories to pass the time away. The range of content available has expanded from the first time I heard of Ether Books on the great Bubblecow website and optimistically submitted my stories. There is Science Fiction, Romance, Crime, Non-fiction, Humour, Contemporary, Serials, Horror, Flash Fiction, Erotica, Articles (Ether Columnists) and an unrestricted range of other types of content. The reliability of the Ether App comes from its screening of content before publishing and formatting specifically for the iPhone and iPad. What has changed with the App in v1.4? Share details of your favourite reads with friends and followers using social media and email. OTA messages to alert you when your favourite writers and genres have new work released. Re-organised the author search function to work by Surname to make it easier to solve. Updated one tap function for ease of navigation when reading in the App. 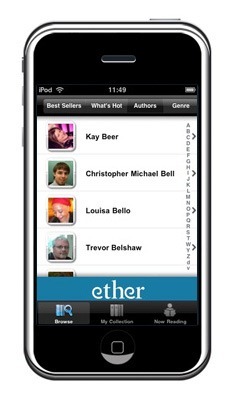 Another area where writers and readers benefit with the Ether Books App, is that if you find writers whose work you enjoy, Ether have been very supportive in providing web links in the Author Profiles and adverts on their website for other work by their writers. So take Rebecca Emin for example or Trevor Belshaw or Rebecca Brown. Click through their profiles and you can go to their websites to see what other work they have published. Indeed, Ether Books have proved to be a great confidence booster for many aspiring writers in the last year. I would not have had The Lazarus Experiment published, and I’m sure Rebecca Emins self-confidence and case for her new children’s novel was helped by being best selling Ether writer month after month (no jealousy here! ), you can’t put a price on the confidence and motivation boost Ether have given rookie writers and the new market place for established and award winning writers. So if you haven’t got the Ether App, download it today! If you do have it already, make sure it gets updated! And when you have the app, why not check out my current collection of stories on the app? Just click on my pretty face in the Authors list. You can see it below. Do you love the Ether App? The Sunday Times is currently taking nominations for its annual App Awards. Support mobile publishing and take a minute to cast your nomination for Ether Books here. This looks so great! I really want to submit to it. Don’t have a good enough phone to download the app yet, though. Will certainly be telling my friends about it.